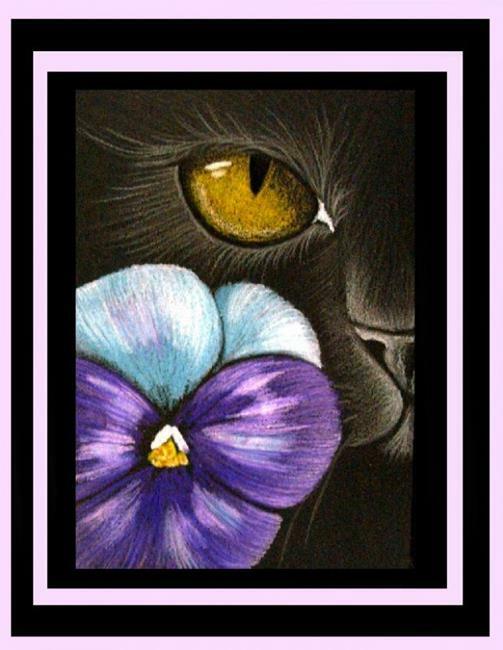 THIS ACEO, CAT BEHIND THE PANSY, IS AN AWARD WINNER FROM EBSQ SHOW. WON THE PATRON'S MENTION AWARD ON NOVEMBER 2006, FLOWER OF THE MONTH SHOW. Pansies are fragrant and edible blooms are desirable in gardens. 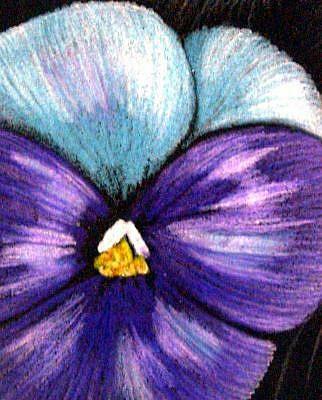 The pansy is linked forever to the viola, its ancestor. Viola is a large genus containing 500 species. The viola family includes both pansies and violets, the former most loved for their perky faces and the latter for their pretty perfume. 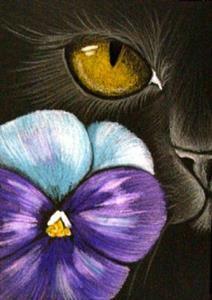 Maybe is the reason for my cat behind this flower. Used Artagain/Strathmore 60lbs. paper with Prismacolor Premier Colored Pencils.